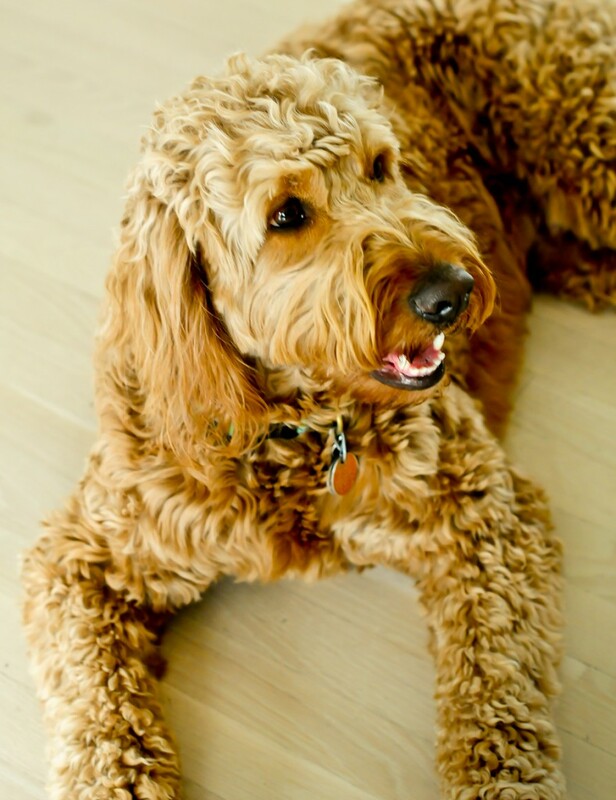 While Susan took beautiful pictures of Zoë, and Zoë chatted with us in her lovely, sunny kitchen, I mentioned in passing that I can’t eat gluten. Zoë said, “Oh, then let’s test my gluten-free pizza dough recipe!” And off she went to another room, returning with a container of gluten-free dough, ready to roll and top. I could happily move in with Zoë François! The pizza she prepared for us – crispy chewy cheesy heaven – is a recipe in development, so she couldn’t share it quite yet. But no matter, given she’s already published a fantastic gluten-free pizza crust in Healthy Bread in Five Minutes a Day, featured below. Be aware that without gluten, this dough has a completely different feel than a traditional bread or pizza dough. There’s no stretch, no bounce, no kneading. To achieve a thin, crisp crust, roll the dough out piecrust-style, between a sheet of parchment paper and a sheet of plastic wrap. 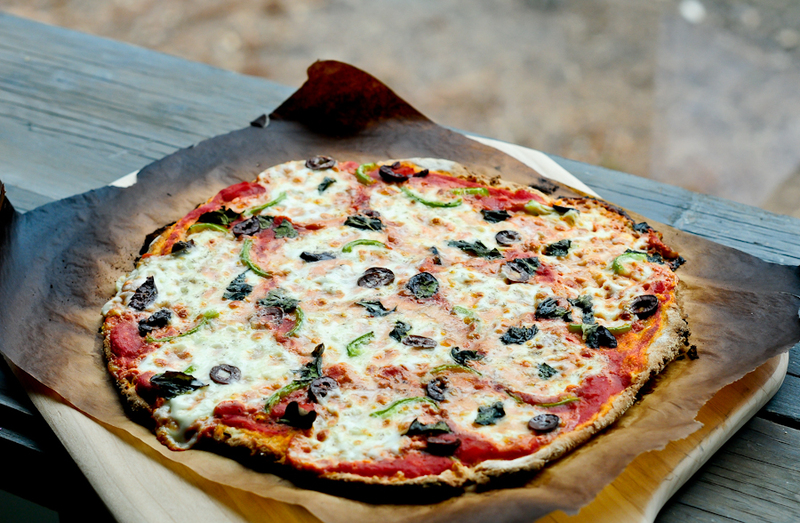 Peel away the plastic and then slide the crust – parchment and all – right on to the hot pizza stone. The paper will turn black but that doesn’t matter. The crust will emerge lovely and brown, not burned, topped with perfectly melty cheese. I almost hate to say this, because I don’t want to imply that gluten-free food is somehow lesser than food made with wheat, but I think you’ll know what I mean when I say: No one will even know that this pizza is gluten-free. It is just…delicious. The pizza crust, ready to be “rolled” out. 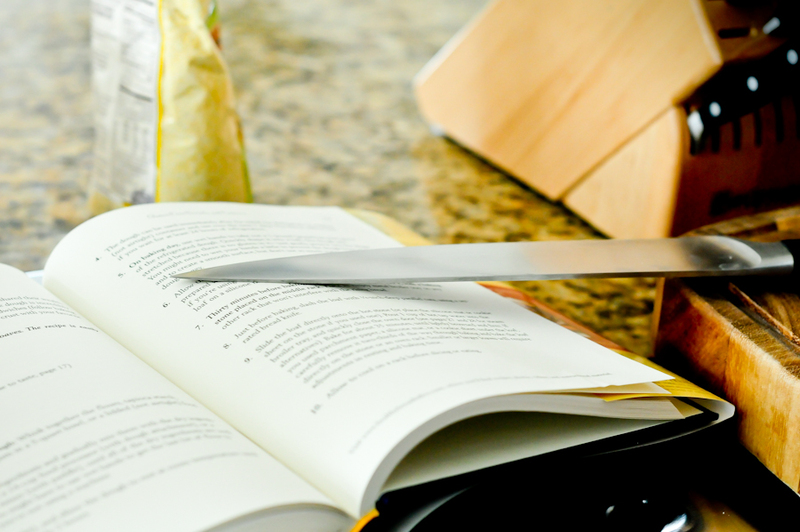 Now that’s a chef’s bookmark! 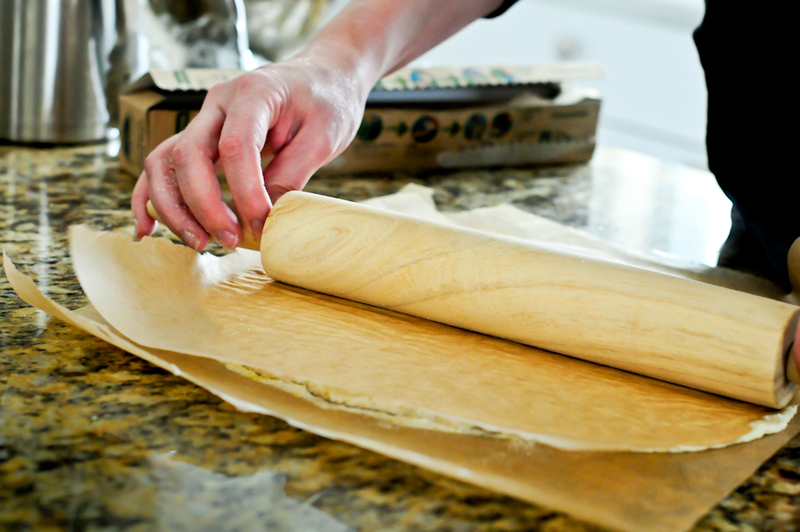 The trick to “rolling” this dough, a layer of parchment on top. Louis hoping in vain for a morsel to fall to the floor. The delicious, fresh sauce is spread over the crust. Makes enough dough for 8 pizza crusts. This recipe is easily halved or doubled. 1. Mixing and storing the dough: Whisk together the flours, tapioca starch, yeast, salt, and xanthan gum in a 5-quart bowl, or a lidded (not airtight) food container. 2. Combine the liquid ingredients and gradually mix them with the dry ingredients, using a spoon, a 14-cup food processor (with dough attachment), or a heavy-duty stand mixer (with paddle), until all of the dry ingredients are well incorporated. You might have to use wet hands to get the last bit of flour to incorporate if you’re not using a machine. 3. Cover (not airtight), and allow the dough to rest at room temperature until it rises, approximately 2 hours. 4. The dough can be used immediately after the initial rise. Refrigerate in a lidded (not airtight) container and use over the next 7 days. The flavor will be best if you wait for at least 24 hours of refrigeration. 1. Thirty minutes before baking time, preheat the oven to 500 degrees F, with a baking stone placed on the middle rack. 2. Prepare and measure all the toppings in advance. 3. Dust the surface of the refrigerated dough with rice flour and cut off a 1/2-pound (orange-size) piece. Dust the piece with more rice flour and quickly shape it into a ball; this dough isn’t stretched because there is no gluten in it – just press it into the shape of a ball. You will need to use lots of rice flour to prevent the dough from sticking to your hands or the work surface, but avoid working lumps of flour into the dough. 5. 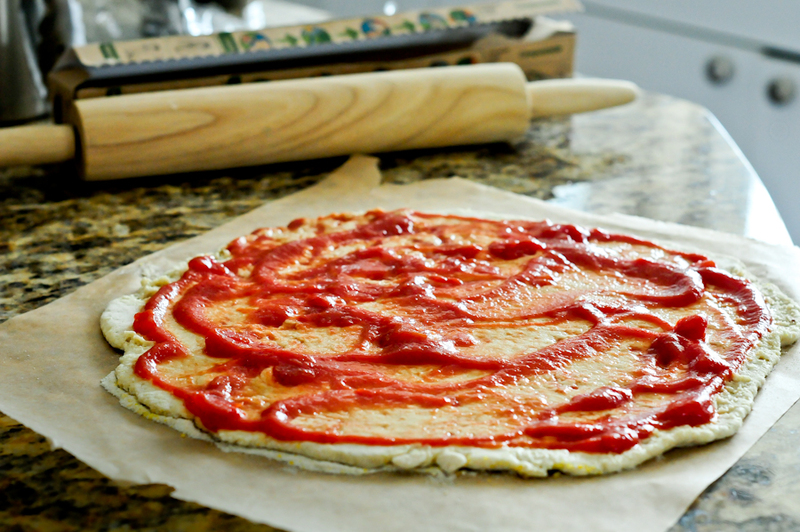 Distribute a thin layer of tomatoes over the surface of the dough. 6. 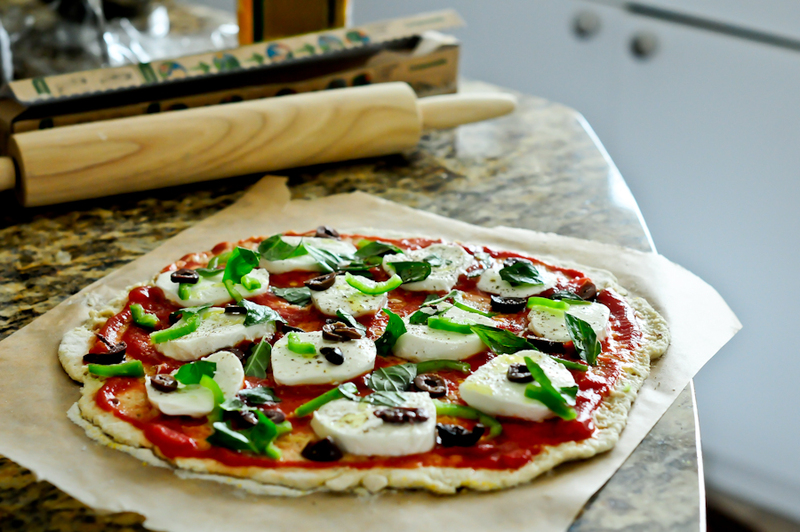 Scatter the mozzarella over the surface of the dough, then the basil, olives, pepper, and Parmigiano-Reggiano, if desired. Drizzle the pizza with about a teaspoon of olive oil. No further resting is needed prior to baking. 8. Allow the pizza to cool slightly on a rack before serving, to allow the cheese to set. Susan….These images are breathtaking. I am not so much into pizza, but know now I have to try this. A work of art!!! I am so happy you girls have taken on this adventure – I LOVE it!! And I finally ordered my own copy of Zoe’s book just last week – should be arriving any day now – can’t wait! I don’t even need to eat gluten free and I want to run out and buy everything to make this pizza! It looks so delicious! I also want to say what a pleasure it was to meet Zoe last week — such a genuine person. I will surely make this over the weekend. Can’t wait! It looks so delicious!!! Looks like one you have to go to a famous restaurant to eat! I must try this recipe! I still haven’t found a decent enough gluten-free pizza dough recipe yet, so hopefully this one will work great. Can the dough be frozen for later use? Thanks! This was an absolutely delicious pizza! It’s better than some that I’ve made with wheat flour. Thank you so much for posting. I can’t really begin to express my excitement over this delicious recipe! Pizza is one of my favorite meals, and I am currently on a strict elimination diet. I made a few changes due to ingredients I had on hand with great success. I used Ener-G Egg Replacer rather than eggs due to my diet (also a great vegan alternative! ), and I was pleasantly surprised that it didn’t have any negative impact on the dough. Also, I didn’t have brown rice flour in my pantry so I used white, and finally, I only had a cup of tapioca starch left, so I subbed in Bob’s Red Mill GF All-Purpose Flour to make the difference. I was afraid that so many changes would result in a mess, but it was so good. 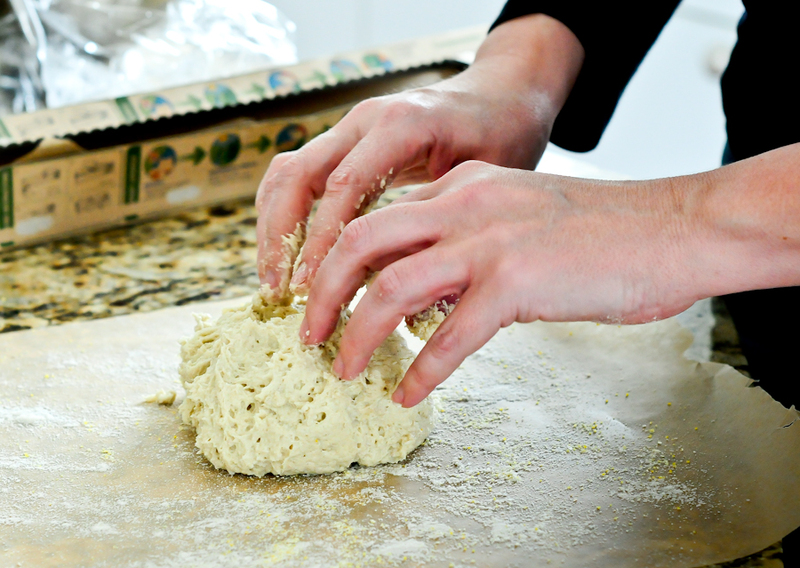 A major bonus with GF pizza dough is that you don’t have all the kneading that goes along with traditional wheat dough! The dough keeps well in the refrigerator, and I felt that the pizza I made after the dough had been chilled a couple days was much more flavorful than the day I prepared the dough. Anyway, thank you for sharing this wonderful recipe! I can’t wait to try it again without all the substitutions. We make this twice a week, always with outstanding results. I often halve the dough, baking one half in a silicone bread pan for toasting bread… one can’t live on gluten-free pizza alone (or could they?). Thank you Zoe and Stephanie for this perfect gluten-free recipe! Ten stars. This looks delicious! I shared this to Pinterest.